Tuxedo Brothers is an event management company owned and operated by brothers, Don Carr and Phil Carr. Don is the President of Tuxedo Brothers and coordinates all Tuxedo Brothers events as Race Director. Phil oversees timing and scoring for all Tuxedo Brothers events. In the early days, the brothers wore tuxedos to the events, the idea being to add a touch of class. After a few events, however, their dress changed to a more reasonable sports attire, but the name, Tuxedo Brothers, remained. Since 1984, Tuxedo Brothers has managed more than 1,000 events, most benefiting service and charitable organizations. Jason Springer is the Marketing Coordinator. Tuxedo Brothers manages a broad range of activities in the fitness world. Tuxedo Brothers manages such diverse events as walking, running, triathlons, biathlons, mini-marathons, and stair climbs. Tuxedo Brothers can handle the needs of both small (300 people) and large (35,000 people) events. Using the most up-to-date timing equipment, Tuxedo Brothers delivers results to the participants almost immediately after the event is finished. All results are posted to the Tuxedo Brothers website within one business day. With more than 30 years experience, Tuxedo Brothers can effectively manage crowds, coordinate your timing and registration needs, recruit volunteers for your event, proficiently market your event, and handle all event logistics from setting up water stations to course design. The company motto is appropriate: Event Management with Style. Want to stay up to date on our events around Indianapolis? Sign-up for our bi-monthly e-Newsletter to receive information about all of our events, ranging from 5k's to marathons, and stair climbs to triathlons! We are also always in need of volunteers! Please contact Jason at Jason@TuxBro.com if you are interested in becoming a volunteer at Tuxedo Brother's events. To alter your registration for one of our upcoming events or request another confirmation e-mail, please e-mail Jason at Jason@TuxBro.com. Permissable alterations to registrations include: change of event, requesting a different shirt size, transferring entries, or altering basic contact information. If you are a triathlon participant and need defer or transfer your entry please review the triathlon rules page prior to contacting us. With nearly 700,000 visitors to our website each year and our contact list of over 48,000 e-mails, our sponsors have the opportunity to receive loads of exposure. Sponsors also have the ability to gain visibility at select Tuxedo Brothers events. Sponsors will gain recognition with their name or logo appearing on entry forms, T-shirts, participant bibs, and other various methods. 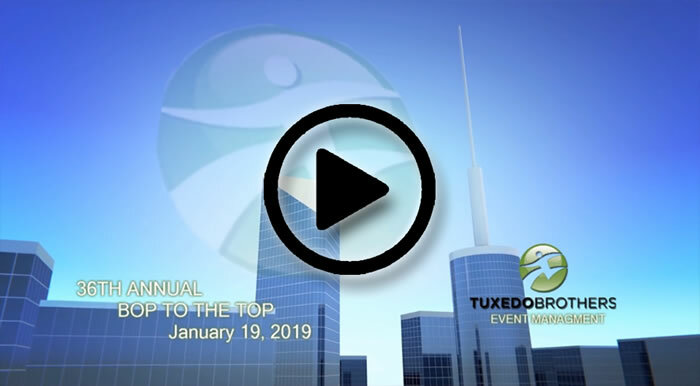 Check out our 2019 Bop to the Top Sponsor appreciation video, below! For more information about becoming a 2017 sponsor, e-mail Meg Osborne at meg@megpromo.com.